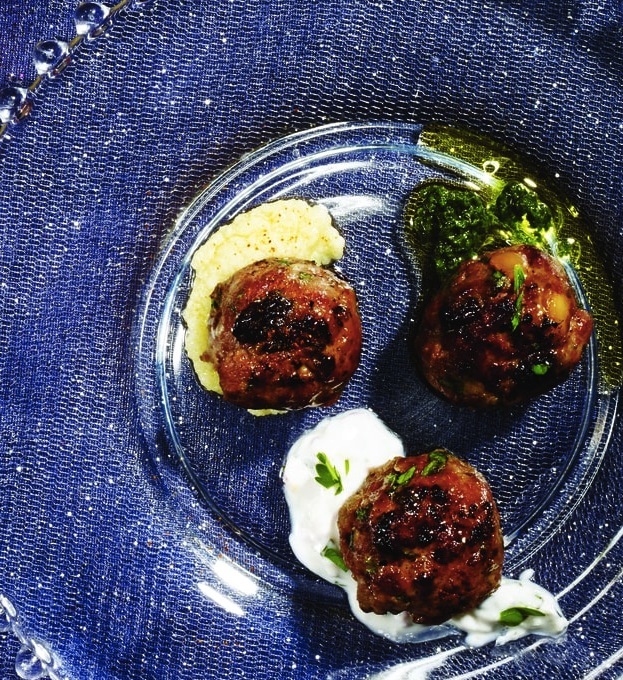 The only problem with meatballs is there are never enough, so make a lot of this ever-popular appetizer with deliciously unexpected flavor and texture from currants and pine nuts. The meatball mix can be prepared a few days in advance and stored, covered, in the fridge until you’re ready to use it. To take this yummy dish over the top, serve it with Herb Sauce (recipe follows). In a small bowl, soak the bread in 1⁄2 cup water for 10 minutes. Squeeze out the water and reserve the bread. 11⁄2 tablespoons of the olive oil in a skillet over medium heat. Add the chopped garlic and the onion and cook, stirring occasionally, until the onion is soft, about 10 minutes. Set aside. Pound or press the other garlic clove into a paste. In a large bowl, mix together the garlic paste, lamb, soaked bread, sautéed onion mixture, salt, cumin, cayenne, cilantro, parsley, pine nuts, currants, and egg. Chill for 30 minutes. Preheat the oven to 400°F. Form the lamb mixture into 24 balls, approximately 2 tablespoons each. over medium-high heat. Working in batches, add the meatballs in a single, uncrowded layer and brown the bottoms, about 2 minutes. Roll and brown the other side, about 2 minutes. Transfer the browned meatballs to a baking sheet and bake in the oven for 5 to 6 minutes. a decorative pick to each one, and serve with the sauce. MAKES ABOUT 1 CUP Also called Charmoula, this bright, thick olive oil-based sauce can be stored covered, in the fridge for up to 3 days. Leftovers would be great over scrambled eggs. In a blender, pulse the cilantro and parsley with the garlic, 1 jalapeño pepper, and olive oil. Blend into a loose, sludgy paste and season to taste with salt. Stir in 2 teaspoons lime juice just prior to serving.